General Appearance: A small, active and graceful dog; medium to fine boned, smooth hairless body, with hair on feet, head and tail only; or covered with a soft veil of hair. Characteristics: Two distinct types of this breed; Deer type, racy and fine boned, and Cobby type, heavier in body and bone. Head And Skull: Slightly rounded and elongated skull. Cheeks cleanly chiselled, lean and flat, tapering into muzzle. Stop slightly pronounced but not extreme. Head smooth, without excess wrinkles. Distance from base of skull to stop equal to distance from stop to tip of nose. Muzzle tapering slightly but never pointed, lean without flews. Nose a prominent feature, narrow in keeping with muzzle. Any colour nose acceptable. Head presenting graceful appearance, with alert expression. Lips tight and thin; An ideal crest begins at the stop and tapers off down neck. Long and flowing crest preferred, but sparse acceptable. Ears: Set low: highest point of base of ear level with outside corner of eye. Large and erect, with or without fringe, except in Powder Puffs where drop ears are permissible. Mouth: Jaws strong, with perfect, regular scissor bite, i.e. the upper teeth closely overlapping the lower teeth and set square to the jaws. Forequarters: Shoulders clean, narrow and well laid back. Legs long and slender, set well under body. Elbows held close to body. Pasterns fine, strong, nearly vertical. Toes turned neither in nor out. Body: Medium to long. Supple. Chest rather broad and deep, not barrel-ribbed. Breast bone not prominent. Brisket extending to elbows; moderate tuck-up. Hindquarters: Rump well - rounded and muscular, loins taut, stifles firm and long, sweeping smoothly into the well let-down hock. Angulation of the rear limb must be such as to produce a level back. Hind-legs set wide apart. Feet: Hare-foot, narrow and long. Nails any colour, moderately long. Socks ideally confined to toes, but not extending above top of pastern. Feet turning neither in nor out. Gait/Movement: Long, flowing and elegant with good reach and plenty of drive. Coat: No large patches of hair anywhere on body. Skin fine grained, smooth, warm to the touch. In Powder Puffs coat consists of an undercoat with soft veil of long hair, veil coat a feature. 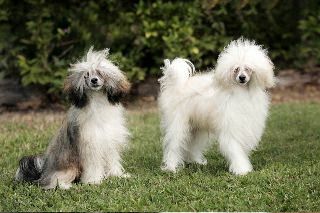 There are two varieties of Chinese Crested Dog, hairless and powder puff. The hairless is hairless except for hair on the head, feet and tail, the powder puff is fully coated with fine medium length hair. Genetically, the hairless gene is dominant and the coated gene is recessive. Because of this, a hairless to hairless or hairless to powder puff can produce hairless or powder puff puppies; while powder puff to powder puff will only produce powder puffs. The hairless gene is unstable, so although it will produce hair on the head, feet and tail, it can produce varying degrees of body hair similar to people where some have more body hair than others. Chinese Cresteds are very people orientated, and just love to be with their owners, whether on their lap or running around the yard. Although they are very friendly and loving with their family, they can be very stand-offish with strangers. They have very individual personalities ranging from very outgoing to very shy. Cresteds love company, and in my opinion do not do well left by themselves day in day out with no companionship. Although they love being with their people best, another dog or cat would do until their person comes home. Chinese Cresteds are essentially a very hardy breed. There are, however, a few health issues that can occur, as with most breeds of dog. Reputable breeders are happy to discuss these concerns and carry out health tests for a number of these problems to reduce the risks of passing them on to future generations, and are aiming to improve the overall health of the breed. Copies of the health test that have been carried out should be made available for viewing to potential puppy/adult buyers. *Progressive Retinal Atrophy (PRA) - there are two forms of this eye problem found in Chinese Crested Dogs. There is a DNA marker for one form, progressive rod cone degeneration (prcd). Scientists in the US are very close to pinpointing the gene for the other form. Until a DNA marker is found for this form, regular ophthalmologist tests should be carried out. *Lens Luxation - another eye problem that is unfortunately quite painful. Again regular ophthalmologist tests will identify this issue. Science has recently made progress with a DNA marker for this painful problem (late 2009). The test is not yet available in Australia, but as soon as it is, I will be testing my dogs for this health problem.